Headlining (sort of) the assessment section of the US Dept. of Education's new tech plan was this cool assessment tool. Although it gives educational feedback, the tool is intended for assessment alone; you'll be guessing if you try to learn first through this. 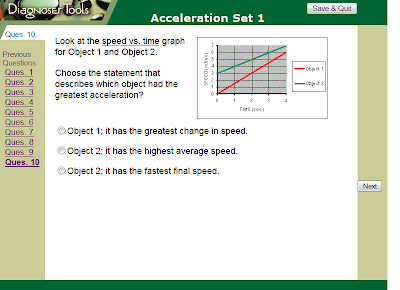 I took a question set on Acceleration (after first making myself a teacher and assigning it!). Herewith the final question, where you really need to understand these concepts and graphs. Since I got it, we'll assume I didn't forget all my pricey degree in physics. And, we'll applaud creater Jim Minstrell for a job well done. You gave best possible answers on 8 out of 9 of the questions in this set. You seem to have a pretty good grasp of this topic. After completing this set you reported that your understanding of this material was "Great! I feel like I could explain the ideas to a friend." The following feedback addresses some of the ideas that may cause you trouble. You may have had these problematic ideas while answering the questions in this set. * You seem to be confusing position data with speed data. 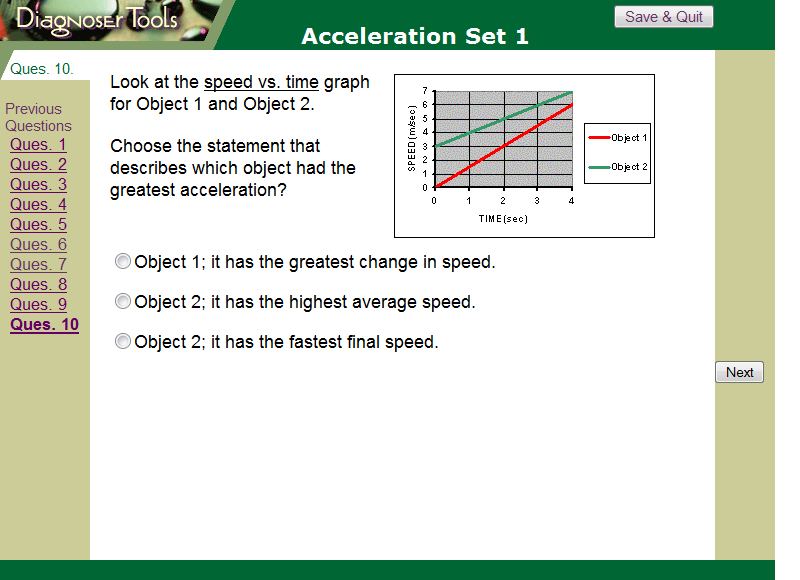 Typically you need to work with speed vs. time data to arrive at acceleration. Check the definition of acceleration and be sure you are working with speed time data. Well, that's not exactly the case. In fact, I was confusing the baby and the elderly lady across the aisle at McD's with what I should have been attending to. So I just missed that the app backed down conceptually from a speed v time graph to a position graph. With the well-designed follow-up question, I realized my error and tried to correct it. The app should have 1) let me and 2) checked again to see if I was guessing, distracted, or just goofy about position and acceleration. Thus the larger issue: these sorts of things need to be iterated through the software development loop many times. Applause to Minstrell for advancing the state of the practice. To the wider ed world, though: Really. How did we arrive at 2010 where this is the leading edge, the best example (online and accessible) that the dept of Ed can find?